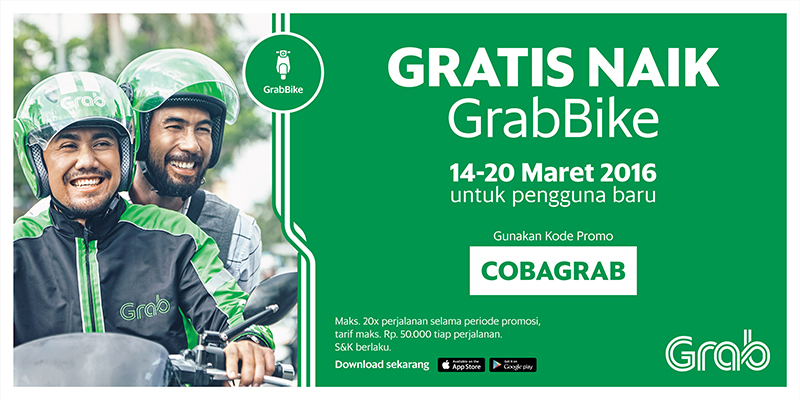 Jakarta, 11 March 2016 – GrabBike, the on-demand ‘ojek’ service provided by Grab (formerly known as GrabTaxi), Southeast Asia’s leading ride-hailing platform, announced that GrabBike will give free rides for the whole week from 14 to 20 March 2016 to new users who have never taken a GrabBike ride before via the Grab app. “With so many places to go and people to see in such a tight timeframe, it is great to have a service that can help busy city folks reach their destination in the most efficient and safest way,” said Kiki Rizki, Country Head of Marketing, Grab Indonesia. GrabBike makes it easier than ever to book an ojek for anyone in Jakarta and Greater Area with just a few taps of a smartphone. Passengers can be assured of their safety with GrabBike rides as 100 per cent of GrabBike riders are licensed, their motorcycle plates information are available on the app and all riders are required to undergo safety riding training before they are allowed to take passengers. Both riders and passengers also enjoy free insurance coverage by Grab. To enjoy the free rides offer, new users only need to key in “COBAGRAB” in the promo code field before each booking to redeem the promotion. Each new user is allowed to use the promo a maximum of twenty (20) times with a maximum fare of Rp. 50.000 per ride, throughout the promotion period. “COBAGRAB” is valid to one unique mobile number with one device only. Since its launch in 2012, the Grab app has been downloaded onto more than 12 million devices across Southeast Asia. More than 220,000 drivers in the Grab network, including all of the services under the Grab app, have been using the app to receive bookings in Singapore, Indonesia, Philippines, Malaysia, Thailand and Vietnam. The Grab app and its services are currently available in 28 cities across six countries in Southeast Asia. Grab is Southeast Asia’s leading ride-hailing platform. We solve critical transportation challenges and make transport freedom a reality for 620 million people in Southeast Asia. Grab began as a taxi-hailing app in 2012, but has extended its product platform to include private car services (GrabCar), ojek (GrabBike), social carpooling (GrabHitch) and last mile delivery (GrabExpress). Grab is focused on pioneering new commuting alternatives for drivers and passengers with an emphasis on speed, safety and reliability. The Company currently offers services in Singapore, Indonesia, Philippines, Malaysia, Thailand and Vietnam. For more information please visit: http://www.grab.co.